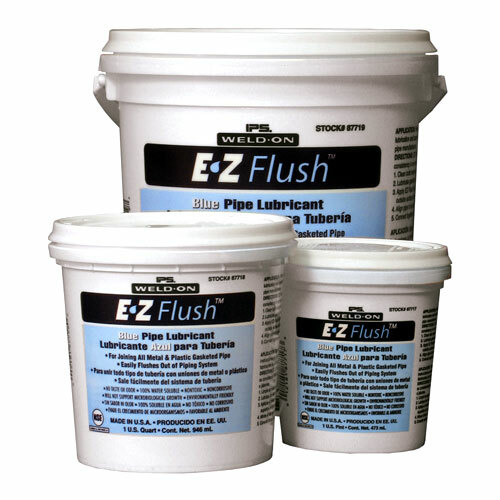 EZ Flush is designed for lubricating slip-on or “O” Ring type joints without harming rubber or plastic gaskets. For joining all metal and plastic gasketed pipe. Will not coagulate and will not promote turbidity. No taste or odor is transferred to fluids in piping system. Non-toxic and non-corrosive. Temperature use range: 0° to 150°F. Flushes completely out. All Seal, Blue Seal, and White Seal can be used on metal and plastic piping systems carrying: air & gases (compressed, manufactured or natural), ammonia, brine, acid (diluted), caustic alkalis (diluted), corrosives, freons, fuel (diesel, gasoline, jet fuel, and kerosene), oils, petroleum, propane, solvents, steam, sugar, and water. Not recommended for oxygen, fluorine, or liquid sodium systems. 505 Key Tite can be used on metal piping systems carrying: acids (diluted), air (compressed or gaseous), alcohols, alkalis (diluted), brine, caustics (diluted), gases (manufactured or natural), low pressure steam lines, sugar (liquid), and hot or cold water.